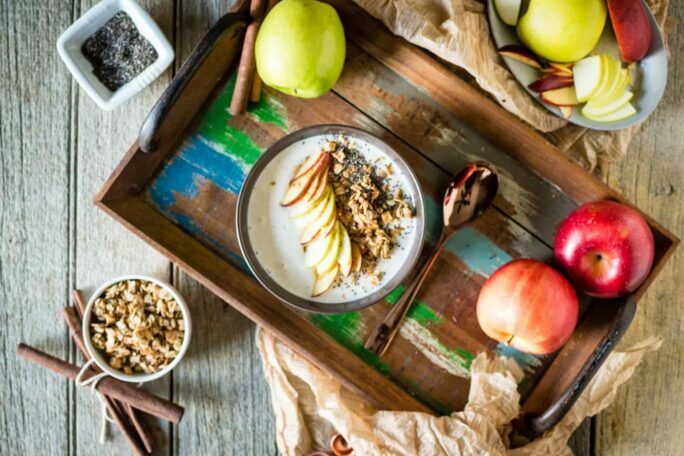 This Chai Spice Apple Smoothie Bowl is the perfect blend of winter flavors in a healthy alternative to heavy breakfasts or a perfect midday pick me up. I teamed up with ALDI for their Try and Tell Program for this post, and where some of the messaging is key to the brand, the smoothie bowl amazingness and opinions expressed in this post are my own. Are you sticking to your goals or letting January come and go as things start up? It’s been terribly chilly here and it’s making my desire to run or ride outside less, but I have been trying to get to the gym and not just hibernate through winter! In the kitchen, I am trying to head back to the basics and cut out a lot of the junk food. When I popped over to my local ALDI to grab yogurt, apples, chia seeds and granola, the store was packed. It makes sense that everyone would come to shop here because people pay way less for high-quality products! ALDI even goes as far as taste testing their products multiple times a year, to make sure that their products meet their high standards and are as good, if not better, than national brands. Anyway, apparently, everyone is gearing up for the gray weather and a little home cooking, because the four or five aisles that typically make up an ALDI store were crowded with shoppers. While shopping the small store, it was only about 10,000 square feet of shopping space, I had to remind myself that seeing people tossing ingredients in the cart for home-made meals was a pretty awesome thing. After my cashier had me laughing about some things (and with another fresh bouquet peeking out of my bag), I left feeling great about my desire to stay healthy and on track (no lie, their grab and bake pizza did catch my eye though). Everything that they do to ensure the best customer service, from stocking the products in their boxes on the shelves to using a coin deposit system for cart returns, really does ensure that their staff can be attentive to their customer’s needs. 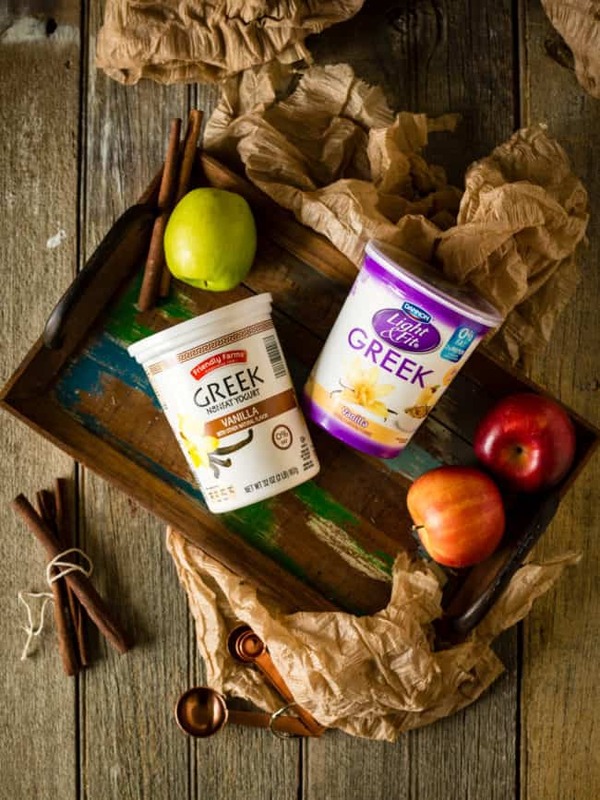 I tested the ALDI Friendly Farms Nonfat Greek Yogurt against Dannon’s Light and Fit Greek Yogurt to see if both were smooth, thick and delicious. 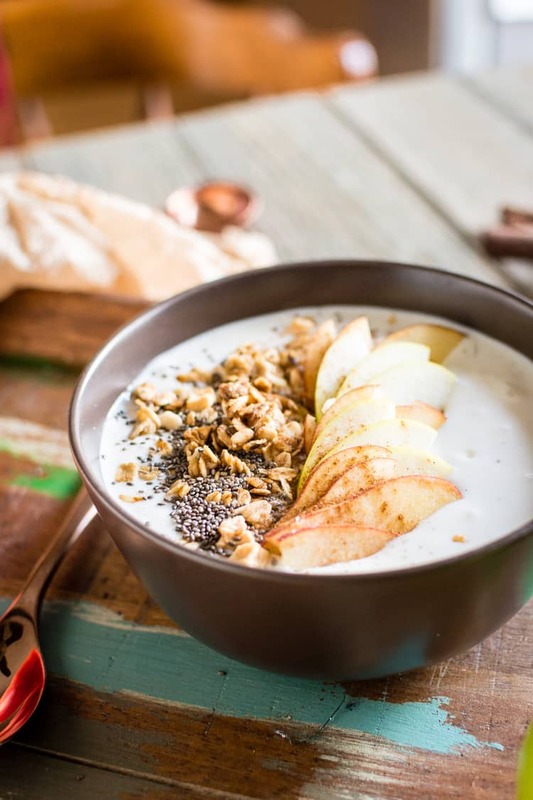 In a side-by-side smoothie bowl spoon off – none of my girlfriends could tell the difference and the bottom line was $1.90 savings on the yogurt alone, which can really add up over time. The extra cha-ching I save on my weekly market budget goes right into the Bucket List trip fund – which is just one more reminder to stay strong through January and stick with my healthy new goals! Change the flavor of this by replacing the chai with apple pie spice or just use a pinch of cinnamon and nutmeg depending on what you have on hand. Elevate it by adding a touch of minced rosemary and sea salt. Add maple syrup and pinch of cinnamon instead of chai spice for a sweet familiar flavor. Use oatmeal to thicken smoothie bowl. Just blend with the yogurt and banana until smooth. Boost the healthy by adding a cup of spinach or kale. It turns your smoothie bowl a bright green, but really adds to the health. Add a bit of your favorite protein powder for a post workout bonus boost to this smoothie bowl. Place the sliced banana in the freezer for 20 to 30 minutes before making the smoothie bowl. Blend the banana, yogurt, coconut milk and chai spice until smooth. Spoon into a bowl. 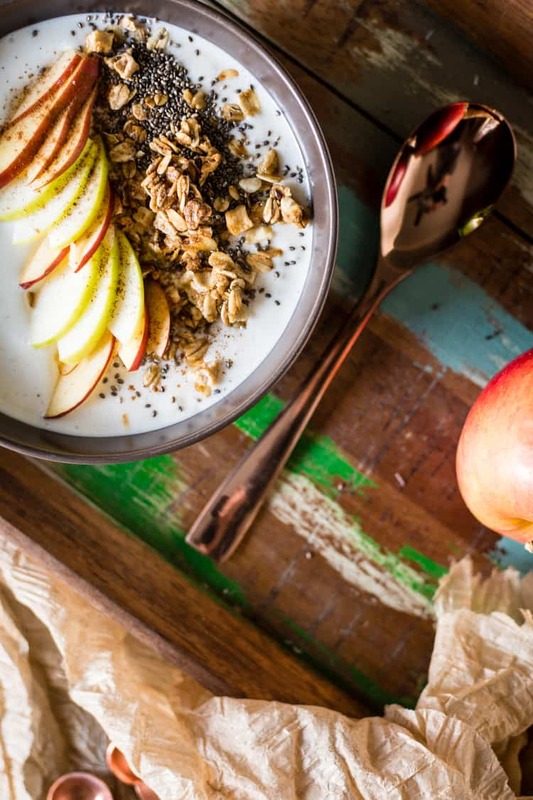 Top with a healthy serving of Apple Almond Honey Granola, chia seeds and apple slices for a delicious breakfast or afternoon snack to keep you moving all day long.